Also, it has become conventional to argue that France has been in slow, inexorable decline since 1900. This is true with regard to the loss of empire and political prestige around the world, but it is also true of all the formerly ‘great’ powers. What has really been happening in France, Robb argues, is the erosion of centralised political control in Paris as the plural identities of France – linguistic, cultural and even religious – re-emerge from the margins. Written as a “social and geographical history” in which “‘France’ and ‘the French’ would mean something more than Paris and a few powerful individuals,” “The Discovery of France” draws its material not just from the usual array of scholarly sources, but from the author’s own back-road explorations on his bicycle. (“This book,” Robb notes, “is the result of 14,000 miles in the saddle and four years in the library.”) Although Robb eschews the orthodox map of French history, his book covers roughly the pre-Revolutionary period to the present day. This is the era usually defined as the France of heroic modernity – the years when French ideas, from Revolution to art, urbanism and poetry, were exported across the world as universal truths. In fact it has proved difficult to demonstrate that this unit, or Grand France, has ever occurred, that it was possible to “forge this swarming continent of microscopic kingdoms into a single nation.” Robb shows that regional peculiarity has always survived despite the convulsions that France has undergone, and that these unique ethnic and cultural traits are re-emerging in the national consciousness. 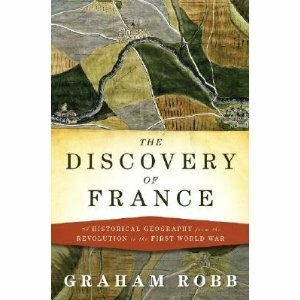 The Discovery of France is the sort of history that seems almost to have disappeared from the world of professional academic historians: written in a light and pleasant style, crammed with colorful and unexpected details, it offers what seem like tantalizing glimpses into a vanished, forgotten past. Robb possesses a masterly narrative style, which floats the reader on a sea of conflicting national identity and linguistic development, while interspersing personal experience with historical analysis. Nonetheless, this is not an academic work to be avoided by francophiles and amateur historians. It is a romantic, slightly nostalgic look at a complex nation still trying to find itself after centuries of nationhood. Most importantly, it is an engrossing read!